March Madness isn’t just about college basketball and brackets. It’s a cultural phenomenon that involves millions of people betting on their ability to predict the outcome of every NCAA game in the March Madness tournaments, usually through small-stakes betting pools set up in their offices. It doesn’t require an encyclopedic knowledge of players’ personal statistics, the teams involved, or even—surprisingly—the sport itself. One of the running jokes of March Madness lore is that the office bracket pool winner is, often enough, the person in the office who knows the least about college basketball. Every year at tournament time, millions of hopeful sports fans fill out their own brackets, hoping to predict the winners of each and every game. There are almost always more than enough upsets to make that an impossible task. In fact, the chance of correctly guessing the winner of every game and having a perfect bracket is staggeringly small: less than 1 in 9.2 quintillion—to be exact, 1 in 9,223,372,036,854,775,808. Those are some long odds. Though there’s nothing like winning, the March Madness event isn’t so much about who comes out on top as it is about workplace culture and forming bonds with your coworkers over a common interest—even one you may not know much about. It goes well beyond that TV that’s on top of the filing cabinets in the back office—it’s about the commonality of watching the games together and rejoicing or commiserating every win or loss as the teams continue up the ladder. That, in a nutshell, is what makes March Madness so special. It’s not about the games or who wins the bracket, it’s about the shared experiences and the opportunities to bond over a common interest. It’s an office ritual that brings with it priceless camaraderie. So how did we at the Connor Reporting office celebrate March Madness? Read on for a recap! By now, you could have spotted the televisions that have taken up residence on the back of file cabinets. If that didn’t clue you in that we are having a good time here at Connor Reporting, you might have noticed an unusual amount of cheering (and maybe even a little booing) around the office, perhaps often directed at those mysterious tvs. That is because we at Connor Reporting had caught the March Madness fever so severe, that we took to watching the games as we worked! 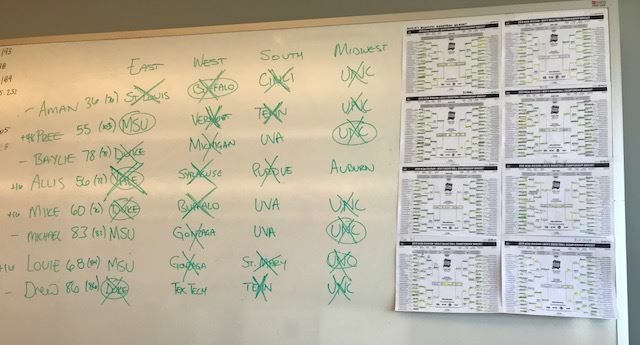 You might have even heard gossip about the infamous whiteboard on which we drew our brackets and have been dutifully keeping tally. Mark our words: the hype was real! While we may jeer at coworkers cheering for that rival team, March Madness brought the office as a whole closer–with plenty of high-fives, laughs, and lots of great food! If you were out of the loop this year, don’t hesitate to jump in on the fun next March! Remember: you don’t have to be an avid basketball fan to share our excitement.